Subhash Chandra Bose (23 January 1897 – 18 August 1945) or popularly known as Netaji Bose was one of legendary Indian freedom fighter who was believed in violent resistance to British Raj, and founded Azad Hind Fauz (Indian National Army), an armed Indian nationalist force. If your are searching for Netaji Subhash Chandra Bose quotes, now you don't need to search for them anymore. As here I have compiled down some of the famous Subash Chandra Bose quotes. 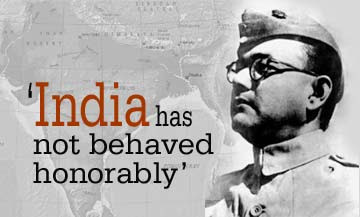 Just hope you will like the quote compilation and learn from the quotes of Netaji Bose. When we stand, the Azad Hind Fauz has to be like a wall of granite; when we march, the Azad Hind Fauz has to be like a steamroller. India is calling Blood is calling to blood. Get up, we have no time to lose. Take up your arms ! we shall carve our way through the enemy's ranks, or if God wills, we shall die a martyr's death. And in our last sleep we shall kiss the road that will bring our Army to Delhi. The road to Delhi is the road to Freedom. It is our duty to pay for our liberty with our own blood. The freedom that we shall win through our sacrifice and exertions, we shall be able to presereve with our strength.